How to Make a Delicious Sweet Cake Squishy Cubit. 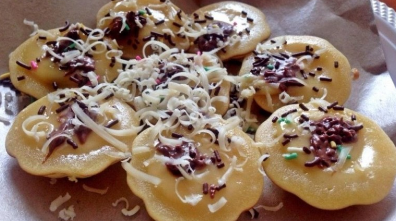 wet cakes which have become a popular snack and can be easily found in many traditional markets is Kue Cubit. The cakes are generally made ​​by adding chocolate sprinkles meses and grated cheese as a topping is presented with a special roasting process in the mold pinch cake. Tekturnya soft and sweet taste and looks cute the main attraction for anyone who saw it. It is simple and easy as well as making a cake pancong by mixing ingredients such as flour, eggs, vanilla, baking soda, baking powder and sugar to manufacture adonanya. After that freshly baked with a cookie cutter pinch to expand and mature. Learn more about how making cakes pinch you can see the recipe below. Mix dough ingredients such as sugar and a pinch of chicken eggs in the container and shake until dissolved and fluffy. Use the mixer to facilitate the process of shaking the eggs. Add beaten eggs with tepun flour, pour slowly while still stirring with a mixer. Add back the egg mixture and flour with margarine that is heated until it melts, vanilla powder, baking powder and baking soda. Continue stirring until evenly distributed. Prepare cake mold pinch, then heat and let spreadable margarine taste. If you already smoke, pour the cake batter into the mold pinch to fill half of the mold. Close mold and wait until adonanya expands. Check the dough is baked, if it begins to expand and slightly overcooked, immediately sprinkle with grated cheese and chocolate meses. then the lid back on and wait until the cake mold pinch completely cooked. Pick up and ready to be served. To ensure pinch-baked cake is ripe or not, you can jab a stick in the middle of the cake pinch, if it still feels sticky mean immature pinch cake back and continue roasting until no longer feels sticky when Kue Cubit pierced back with sticks. In addition to pinch cake with chocolate topping and grated cheese meses, you also can create variations pinch cake by adding small pieces of jackfruit cooked in batter. Congratulations to create. 0 Komentar Untuk "How to Make a Delicious Sweet Cake Squishy Cubit"